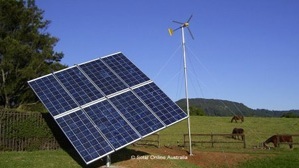 This 2kW solar wind hybrid system installed on Saddleback Mountain in Kiama NSW features a Bergey 1kW wind turbine on a 10m tower and a 1kW solar array on a ground mount solar tracking frame. The solar tracker features an electrically driven linear actuator to ensure that the array is always pointing at the brightest spot in the sky maximising energy output. Kiama’s high average wind speeds makes this site particularly suitable for wind energy production. Our customer has witnessed outputs from the turbine in excess of 50 Amps (i.e >1500W!). 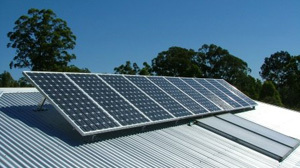 1.75kW stand alone solar power system installed in Glen Martin NSW in 2005. This system consists of 10 x Sharp 175W monocrystalline solar panels, Outback FM80 MPPT solar controller, Century Yuasa 24V 1320Ah deep cycle battery bank and a Xantrex PS2524 2500W 24V pure sine inverter charger. 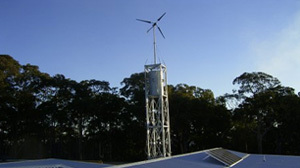 3kW Solar Wind Hybrid power system installed at Laguna NSW in 2005. This system consists of 12 x Sharp 165W polycrystalline solar panels, a Southwest Windpower Whisper 1kW 48V wind turbine with controller, an Outback MX60 MPPT solar controller, Century Yuasa 48V 1320Ah deep cycle battery bank and a Xantrex SW4548E 4500W pure sine inverter charger. 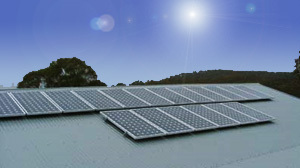 3.15kW stand alone solar power system installed in Goulburn NSW in 2006. System includes 18 x 175W Sharp Solar Panels, an Outback MX60 MPPT solar controller, Century Yuasa 48V 1320Ah deep cycle battery bank and an Outback VFX3048 3000W pure sine inverter charger. 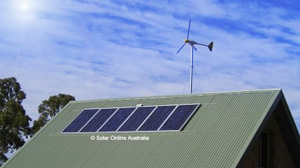 This 2kW solar wind hybrid system installed in West Wallsend near Newcastle NSW features a Bergey 1kW wind turbine on a 13m tower and a 1kW roof mounted solar array. This system includes a Latronics 530BKZ24 3000W pure sine wave inverter, a Plasmatronics PL series solar regulator complete with shunts to allow metering of the high DC currents from the turbine and to the inverter and an Exide EnergyStore deep cycle battery bank.